The warmer weather is a great excuse for rediscovering all those zesty, uplifting, fruity scents that the beauty world loves to roll out onto shelves for summer. 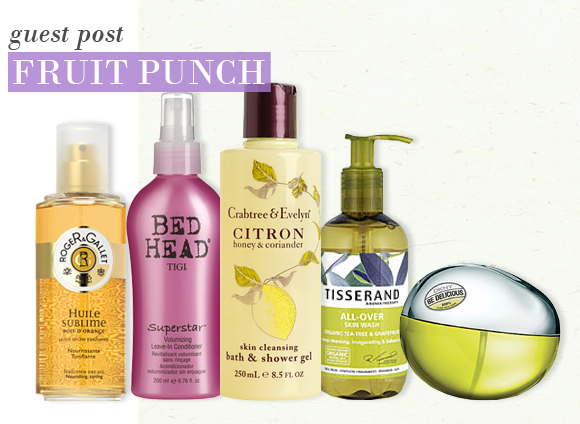 Being a fragrance addict, I really can’t get enough of them – so this week, I have selected a few of my favourite fruit-punch products to make the season go with a sweet-scented bang! Orange is one of those scents that I can love or hate. If it’s sweet and saccharin, it can make my stomach turn (remember that dreadful drink from our youth; Sunny Delight? That’s what I mean). But when it’s done right, with subtle, almost floral notes, it’s always love at first sniff… Roger & Gallet Bois d’Orange Huile Sublime Perfumed Dry Oil, £23, falls into the latter category. The product – which can be used on face, body, or hair for an instant boost of moisture – transports me straight to the Mediterranean. It laces skin and hair in uplifting, but really pretty orange-scented notes – and you won’t need perfume, this is enough. There are plenty of energising lemon shower gels on the market, which work perfectly for waking you up in an early morning shower – but they aren’t exactly innovative. So when I see a product with unique blends of ingredients, it always jumps out from the shelf. Crabtree & Evelyn Citron, Honey, and Coriander Skin Cleansing Bath & Shower Gel, £13.45 is one of those products… With just enough lemon to make it refreshing and zingy, but a greener, slightly spicier edge (thanks to the Coriander), it makes for a really fabulous shower experience to kick start the day. When beauty products are infused with the scent of apples, it gives them a fun, youthful edge – and that’s exactly what DKNY Be Delicious Women Eau de Parfum Spray, from £31, has to offer. It’s not the kind of scent I would choose to wear on a sophisticated night out, but neither is it pretending to be. The juicy, mouthwatering top notes of apple make it the ideal scent for laidback summer days and fun weekends. Spray it generously and enjoy! If my hair is laced with a lovely scent, I can smell it all day long – and that’s incredibly uplifting. And if you like the smell of strawberries as much as I do, you should get your mitts on a bottle of Tigi Bed Head Superstar Leave-In Conditioner, £7.39 – as that last-all-day-long scent will be the irresistible notes of strawberries and cream. The scent isn’t the only great thing about this product, however, as the hydrating, detangling, conditioning formula leaves locks softer and shinier. I’m not a huge fan of the taste of grapefruit. The smell, however, is amazing and every once in a while, I’m tempted into buying one and giving it another chance – but I’m always disappointed by the bitterness. So from now on, I am going to satisfy that urge with the zesty scented Tisserand All Over Skin Wash in Organic Tea Tree and Grapefruit, £6.75. Not only does it leave my skin squeaky clean, but the scent is an instant wake-up call when I’d much rather still be in bed. I keep the bottle in the shower and use it every morning. While on holiday in France, I realized I had left my Chanel Dry Oil Spray. I have really dry skin and while pricey, I do indulge. I went to the Pharmacy and with my Spanish and my friend's broken French, we were able to convey my needs. Well the Pharmacist recommend this product. It is fantastic and will replace my Chanel Dry Oil Spray. It is wonderful. I hope I can have it shipped to the States. What a wonderful product. This entry was posted on Monday, June 20th, 2011 at 8:25 am and is filed under Guest bloggers, Haircare, Skincare. You can follow any responses to this entry through the RSS 2.0 feed. You can skip to the end and leave a response. Pinging is currently not allowed. Even though it’s a grey day, this post is getting me in the Summer mood. All those products sound good enough to eat!